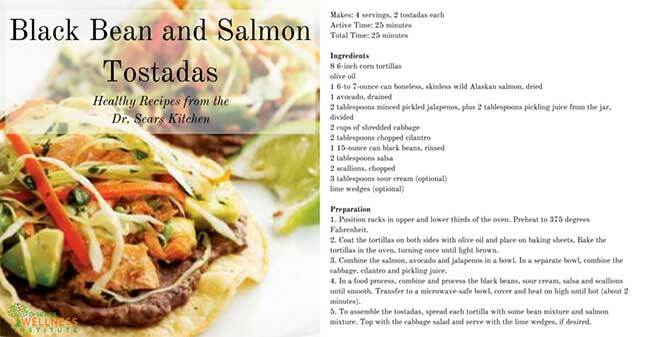 In honor of National Men Make Dinner Day, which falls on the first Thursday of every November, we’ve revamped this Black Bean and Salmon Tostadas recipe so that it’s easy enough for the man in your life to make, yet healthy enough to serve to the whole family! 1. Position racks in upper and lower thirds of the oven. Preheat to 375 degrees Fahrenheit. 2. Coat the tortillas on both sides with olive oil and place on baking sheets. Bake the tortillas in the oven, turning once until light brown. 3. Combine the salmon, avocado and jalapenos in a bowl. In a separate bowl, combine the cabbage, cilantro and pickling juice. 4. In a food process, combine and process the black beans, sour cream, salsa and scallions until smooth. Transfer to a microwave-safe bowl, cover and heat on high until hot (about 2 minutes). 5. To assemble the tostadas, spread each tortilla with some bean mixture and salmon mixture. Top with the cabbage salad and serve with the lime wedges, if desired.